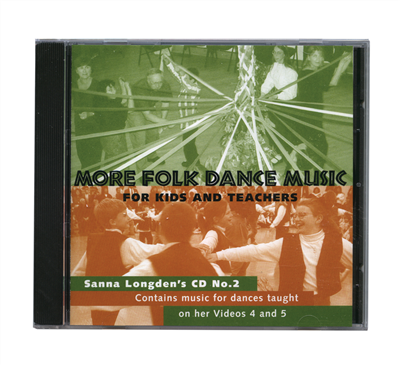 12 enjoyable traditional dances, for all levels of learners. An online link to downloadable PDF files of the syllabus of dance directions is included. 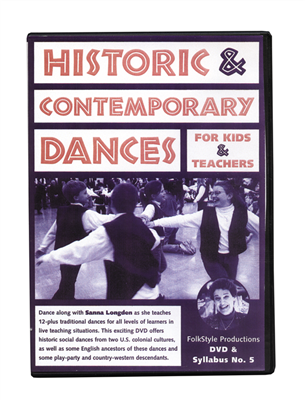 *Music for these dances with the dance directions are on CD 2 (850483). DANCES:1. Grand March - Processional for as many as will (w.Europe, USA, international - from ancient times until today). 2. * Constant Billy - Cotswold Morris Dance - Longways for 6 people. (s.England-from ancient times).3. 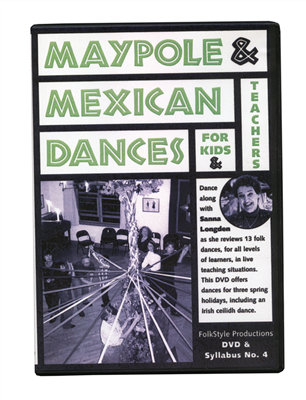 * The Peopleton Stick Dance - Border Morris Dance - Longways for 6-8 people (w.England-from ancient times) and its descendant, "Pop Goes the Weasel".4. Jenny Pluck Pears - English Country Dance - Round for 3 couples (England - 16th-17th centuries).5. * The Sir Roger de Coverly - English Country Dance (adapted and traditional version) - Longways for 5-6 couples (England and US eastern seaboard Colonial - 16th-18th centuries).6. * The Virginia Reel - Contra Dance - Longways for 4-6 couples (US frontier - 19th century).7. La Belle Catherine/The Muffin Man/Pam & Pat Reel - Contra Dance arranged in eastern US Colonial style - Longways for 4-6 couples (US eastern seaboard Colonial and Frontier - 18th-19th centuries).8. * The Minuet - Partner dance arranged for classroom and social dance groups - Column of couples for as many as will (w.Europe and eastern US - 18th century).9. * El Vals de los Panos - Progressive trio dance with kerchiefs - Trios facing trios (sw Spanish-American Colonial US - 18th-19th centuries).10. * Cotton-Eyed Joe - Country or Tex-Mex dance - Group and partner versions (Texas-Mexican border - late 19th century to present).11. * Country-Western Line Dance to "Boot Scootin' Boogie" and others - Lines of individuals facing same direction (general US - late 20th century).12. * Country-Western Double Line Dance to "I Love a Rainy Night" and others - Partners facing in longways or scattered (general US - late 20th century).